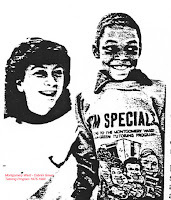 In 1993 I and a few others launched the Tutor/Mentor Connection (T/MC) with a goal of helping well-organized volunteer-based tutor/mentor programs reach youth in every high poverty neighborhood of the Chicago region. During 1993 a local public relations firm, PCI, Inc. helped me develop a 10-point strategy that we narrowed down to four steps over the next few years. Step 2 in that strategy focused on creating a greater frequency of news stories about tutoring and mentoring and why programs are needed so that more volunteers and donors would reach out and support existing programs. This page shows print media stories resulting from that strategy. There were many other Radio/TV interviews and much has been done using the Internet since 1998. Most of these interviews were generated from events we organized each year, such as the Tutor/Mentor Leadership and Networking Conference and Chicagoland Tutor/Mentor Volunteer Recruitment campaign. However, we also developed another strategy, which I called "The Rest of The Story". When the major Chicago newspapers gave full or half page attention to violence, poorly performing schools, gangs and/or poverty, we recognized that more than a half million readers might be looking at that story. So we created maps showing where the incident happened, and added poverty overlays and schools-on-probation overlays to show why it was happening. We also added icons to show existing non-school tutor and mentor programs in the map area, and icons to show assets, such as banks, colleges, hospitals, faith groups, etc. who were in the area and who should be helping tutor/mentor programs grow. We than put these in our print newsletters and shared them at conferences and other events. The goal was to capture reader attention and desire to help within a few days of when the story took place. Over the past 20 years many map-stories have been created with this goal in mind. You can find some here, and others here. My goal has always been that the articles I write serve as inspiration and models for articles that would be written by others. Students in public and private schools, colleges and or working in faith groups, libraries and/or non-school programs could be writing stories following violence in their neighborhoods. Here's an article from 2014 that outlines how this could happen. If I'm the only one writing these stories too few will ever see them and even fewer will be influenced to reach out and support tutor/mentor programs throughout the city. If hundreds of youth from different schools are doing this, stories would appear every day, just as often as we're seeing stories about athletes and others who #takeaknee to protest poverty, injustice and inequality. 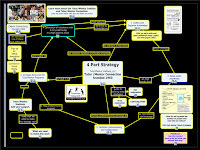 Here's a presentation describing the Rest of the Story strategy. 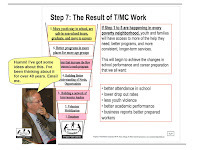 There are dozens of other articles on this blog that focus on the challenge of building attention and a flow of resources to tutor/mentor programs throughout the city, and keeping that attention and those resources flowing for many years. Students could read these articles and rewrite them using their own talent and skills, reaching more people and creating a future they want for themselves and for others. Visit this page to see work interns have done in past years. If you're interested in doing this work go ahead. If you'd like my help just reach out to me here or on Twitter or Facebook. 4-20-2018 update - Here's an article by Peter Levine, who leads the Center for Information & Research on Civic Engagement - CIRCLE project. 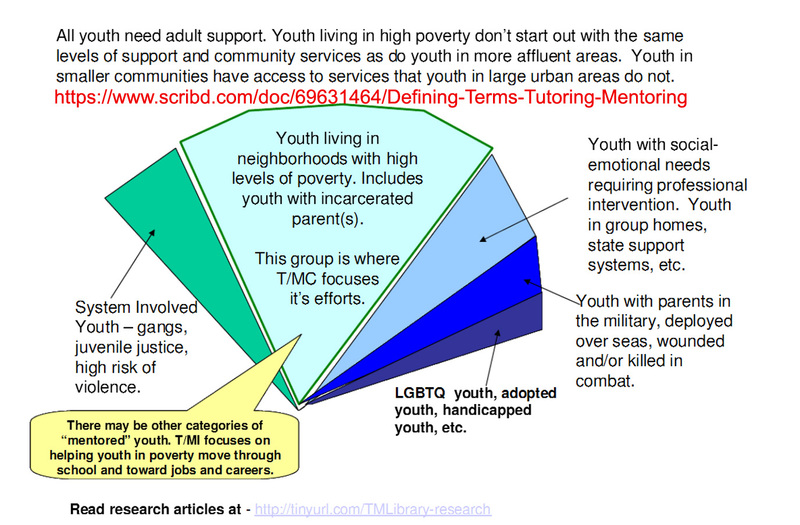 It's titled "What does youth civic engagement have to do with inequality?" 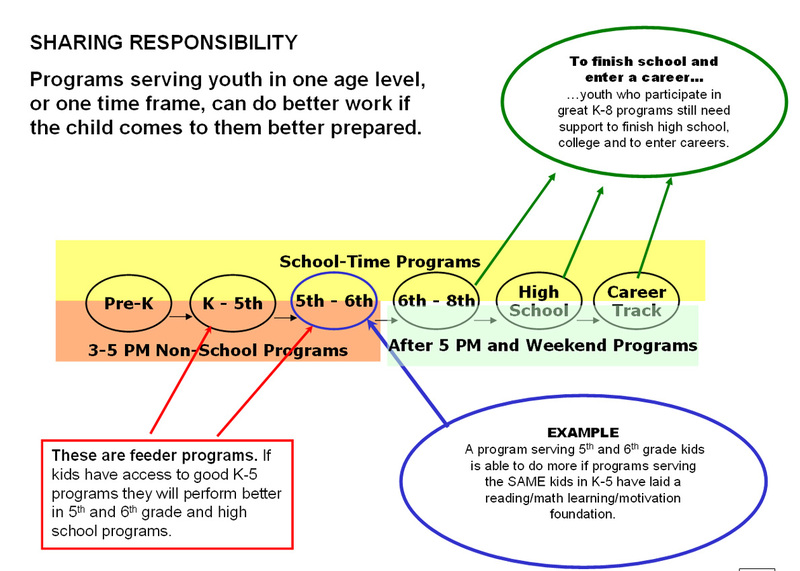 This is a graphic that I've used often over the past 20 years to show that the outcomes we all want for kids requires work done at the bottom of this pyramid. You can find this graphic in this PDF. Below I've created some images that focus in on different elements of this graphic. 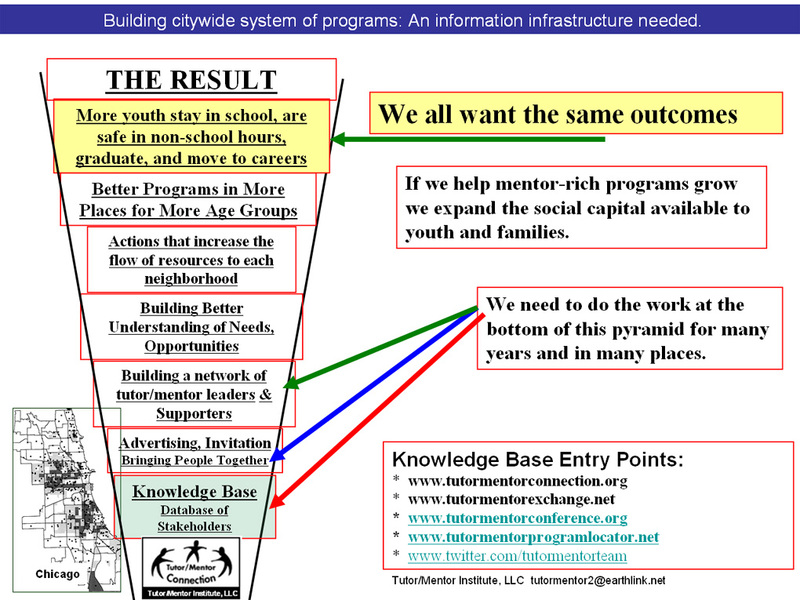 The ideas apply in building systems of support for inner city youth, and for solving any other complex problem. At the bottom of the pyramid is the knowledge that we draw upon to propose solutions to problems. While we each have our own personal experiences, and some have studied an issue for their entire lives, most don't have a broad reference base that they draw upon to support where and how they get involved. Building a knowledge base that supports the decisions of others who need to be involved in solutions to problems is an essential first step. Keeping this up-to-date is an on-going challenge. 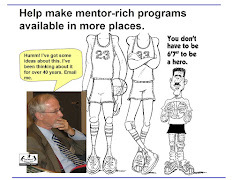 I've been building a web library and directory of non-school tutor and mentor programs since the early 1990s. Initially I did this to support youth, volunteers and leaders in the tutor/mentor programs I was leading in Chicago. 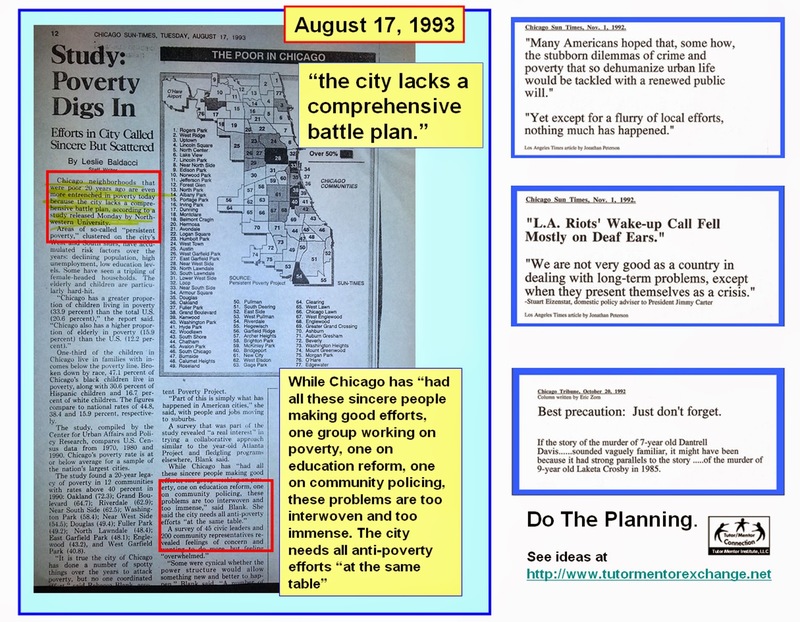 As I formed the Tutor/Mentor Connection in 1993 I began to share this information more consistently with others throughout Chicago. 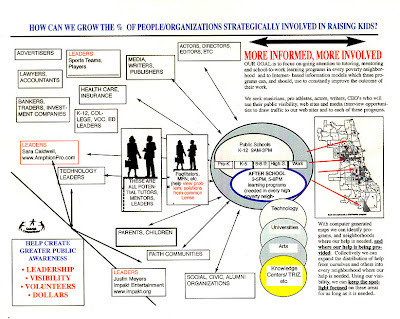 The knowledge collection role is Step 1 of the 4-part strategy I've led since 1993. Read more about what I've been trying to do in this Tutor/Mentor Learning Network article. Competing for attention. Drawing users to library. Building and sustaining a library of information and ideas is one thing. Creating daily advertising and public education that draws a growing number of learners and users to the information is a very different challenge. Most youth serving organizations don't have powerful marketing teams working to draw attention and resources to them on an on-going basis. Innovating ways that more people take roles in building public awareness and draw viewers to information in the library has been a priority of the T/MC since it was formed. This is Step 2 of the 4-part strategy. I find too few conversations that focus on this step. With the Internet we have a growing "Crisis of Attention", which is described in this article. I keep looking for conversations where people are thinking about challenges of competing for people's attention in an environment where so many others have far more resources. I've written many articles focused on "creating attention". Take time to read through them. Building the network. Part of my web library focuses on "who needs to be involved" which includes a directory of non-school tutor and mentor programs in Chicago and around the country and a data base and collection of more than 2000 links that point to others who are involved in some way in efforts to help kids move through school and into jobs and careers. Getting representatives of these organizations and resource providers together to learn, share, build relationships and innovate shared solutions to problems is what I focus on in this stage of the pyramid. Unless people in business, philanthropy, faith groups, media, politics, etc. are coming together on an on-going basis, for face-to-face and on-line learning it will be difficult to create and sustain collaborations that help build and sustain high quality youth supports. 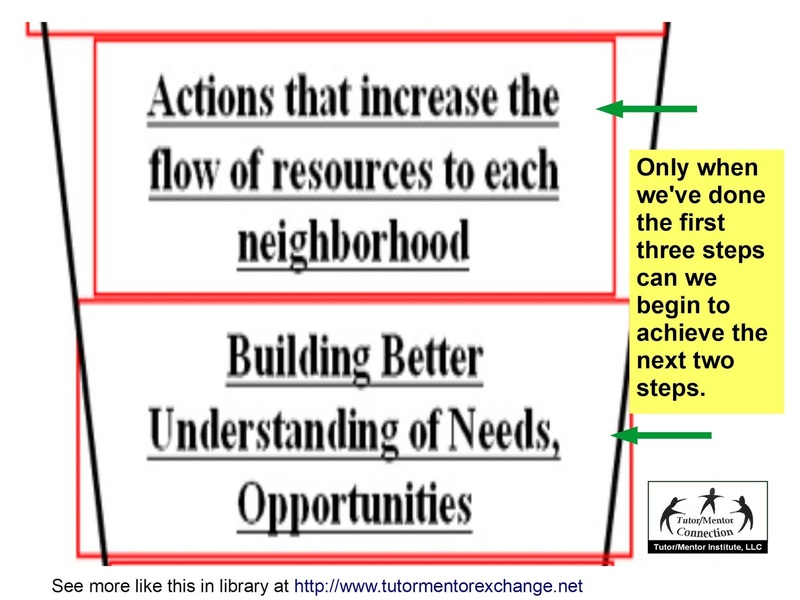 In this blog article I show that a "village" of people with different talents and networks needs to be involved helping every tutor/mentor program grow, as well as helping many programs grow in specific neighborhoods and entire cities. This is part of Step 3 in the four-part strategy. These first three steps need to be happening on an on-going basis, reaching people throughout Chicago, Illinois and the world. However, they are just the start. Better information, read and understood by more people, creates a better understanding of what types of youth support programs have the best chance of having a positive impact on youth and volunteers. Better information also helps people understand the challenges involved, which are many. This needs to lead to actions that support programs in more places. 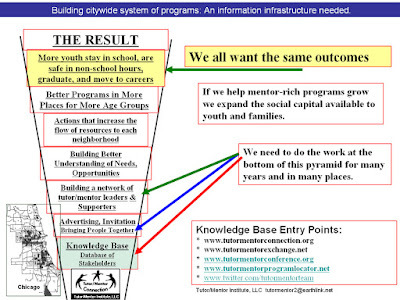 If more of the stakeholders, including resource providers, are looking at this information, they can develop a set of actions that generate a flow of on-going resources (talent, dollars, ideas, technology, etc) into every high poverty neighborhood, to every tutor and mentor program operating in those neighborhoods. I think this is the weakest link in this process. Most programs compete with others for scarce resources. Most foundations use requests-for-proposals and competitive grants and competitions to decide who gets funded. There are only a few winners and many losers. Often prizes and grants are one-time gifts, not repeated from year-to-year. No business could grow to be great on this type of funding stream. Yet, I see few leaders using maps to show a need to draw resources to all poverty neighborhoods, and to all of the organizations working in these areas. 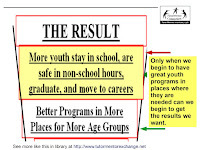 A better flow of needed resources to youth serving organizations (Step 4 in 4-part strategy) leads to more and better programs serving k-12 youth in more of the places where they are needed. 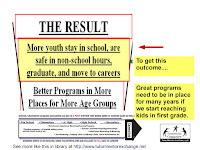 I can't tell you how often people ask about "outcomes" without talking about the work needed to build well-organized, mentor-rich non-school programs. This leads to the final graphic. It can take several years for a business to become profitable, or for a youth-serving organization to build the team of staff, leaders, volunteers, parents and youth that makes it a "great" program. However, that's only the start. If a youth enters a great program in first grade, or 7th grade, it will still take 12 years for the first grader and six years for the 7th grader, just to finish high school! It will take four to six more years for that young person to move on into adult lives and roles, and to jobs and careers that enable him/her to raise their own kids outside of the negative influences of high poverty. 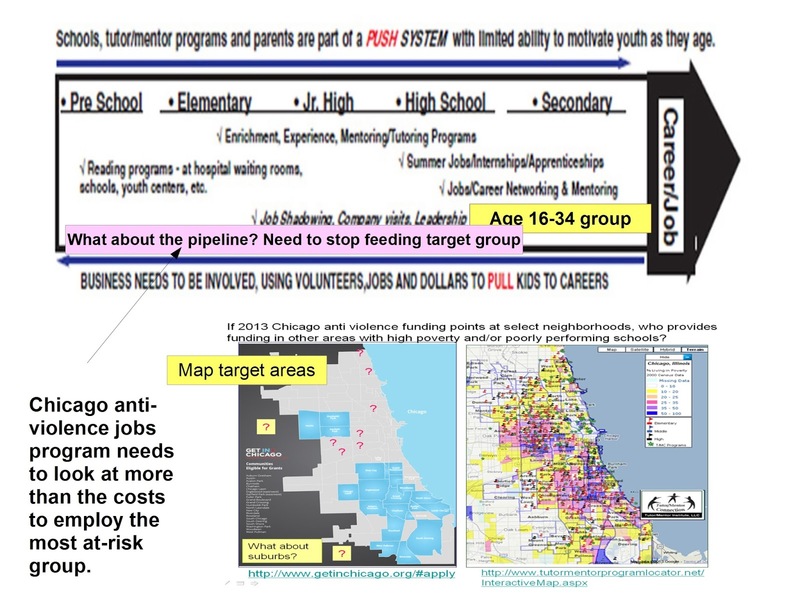 I used this birth-to-work arrow in many other articles, such as this one, which is a discussion of the costs involved in a program intended to create jobs for 32,000 young men in a few Chicago neighborhoods. I created this 'race-poverty' concept map to illustrate the many other factors that influence life outcomes for kids born or living in high poverty areas. A few days ago I read an article titled "Why do we keep insisting that education can solve poverty?" Here's the challenge. As a nation we're not very good at keeping the focus (and flow of resources) on problems and solutions to the time it takes to actually begin to solve the problem. While this 1993 Chicago SunTimes article includes a map, very few leaders in 2017 are using maps to emphasize all of the places where kids, families and schools need help to aid youth as the move through school and into adult lives. Read more about this. Read this article about "building public will". 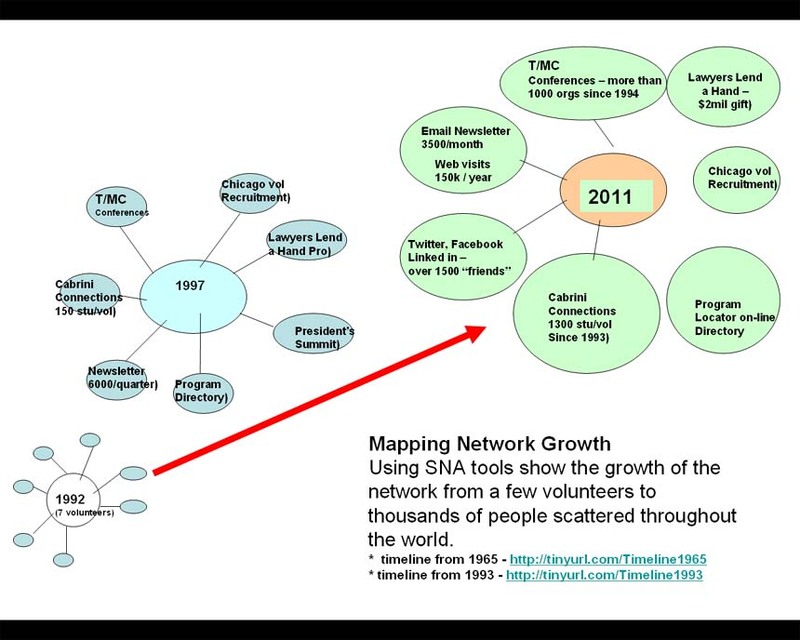 I started this article with this graphic, and pointing to this presentation on Slideshare. Poverty is a complex problem, requiring many different types of resources in the same place at the same time. 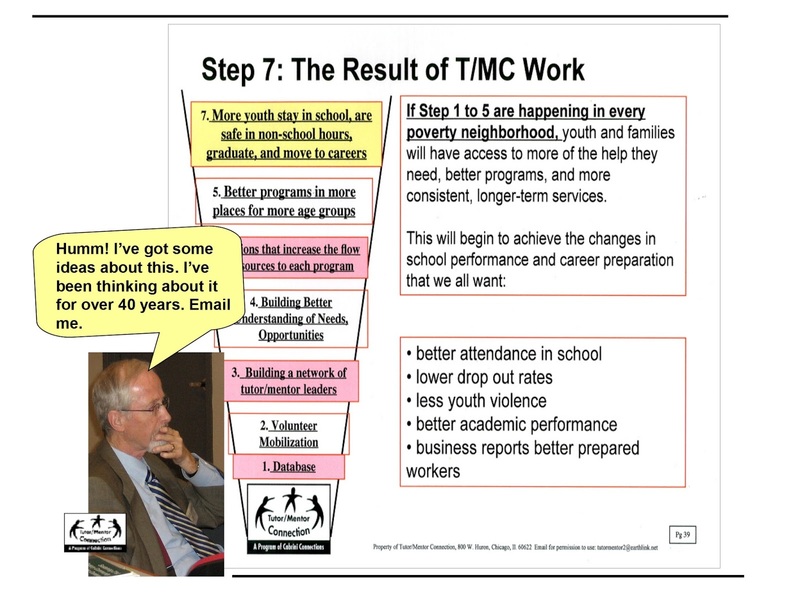 If we want more youth to stay in school, be safe in non-school hours, graduate from high school and move on to jobs, careers and adult responsibilities, we need to do the work shown at the bottom of this pyramid. In my own work I've never been able to get enough people together for an on-going basis, just to talk about ways we create and share the knowledge I've been collecting with more potential users. If you're interested in taking a role please reach out to me. Can you help me do this work? Visit my FUND ME page and add your support. Thank you. School started a few weeks ago and volunteer-based non-school tutoring, mentoring and learning programs have been recruiting, screening, training and preparing matches as they start their programs for the 2017-18 school year. In most site based programs there will be one or more computers and almost all volunteers will have their own phones, and perhaps laptops, too. That means that all of the information on the Internet is available to support what volunteers and students do every week. I've been building a web library to support tutors and mentors since 1998, which I started in the 1970s when I was leading a site based program in Chicago. 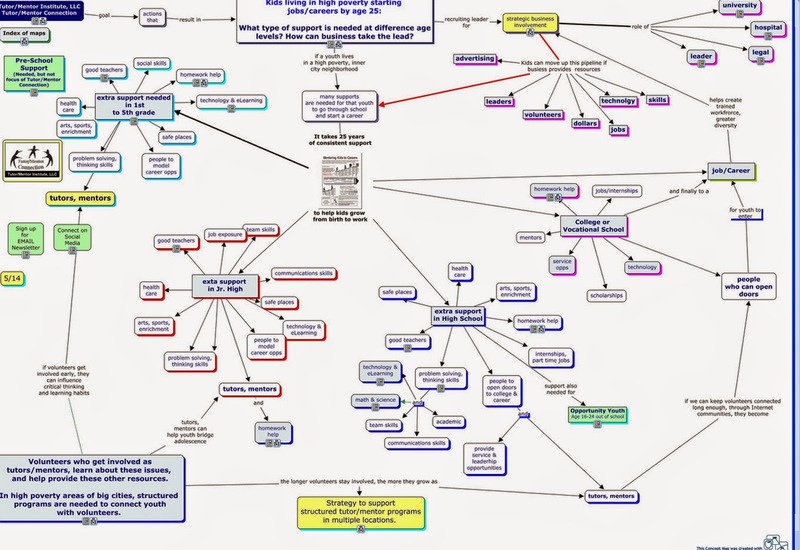 Below is a concept map showing the homework help sections of the web library. I created the short video below to guide you through this concept map and to encourage you to use it to find resources that tutors, mentors, students, parents and educators can use on an on-going basis. Toward the end of this video I encourage youth and volunteers to use blogs to write about the on-line resources they use, showing what they like and how they were used. This is a great way to reinforce the habit of learning and sharing what you learn. It also reinforces what is being learned. I created this concept map, and this blog article, to show how schools and youth organizations should focus on building student and volunteer habits of visiting web sites continually to get and give information. This is not only important now, as students are in school, and connected to a volunteer tutor/mentor, but it is important for the future. Programs who can attract alumni to their web sites in future years can collect information that shows long-term impact, and can draw alumni into efforts that support the program, and support youth who will still need tutor/mentor program support in future years. These resources are constantly updated. If you see broken links let me know. If you find new resources that should be added, let me know. If you write about these on your blog, I want to add your blog to the list that I follow. Finally, if you want to provide some financial support to help me continue to keep this resource on-line, click here and add your support. 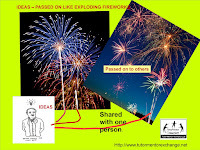 I included the fireworks graphic in blog article I posted last Sunday. 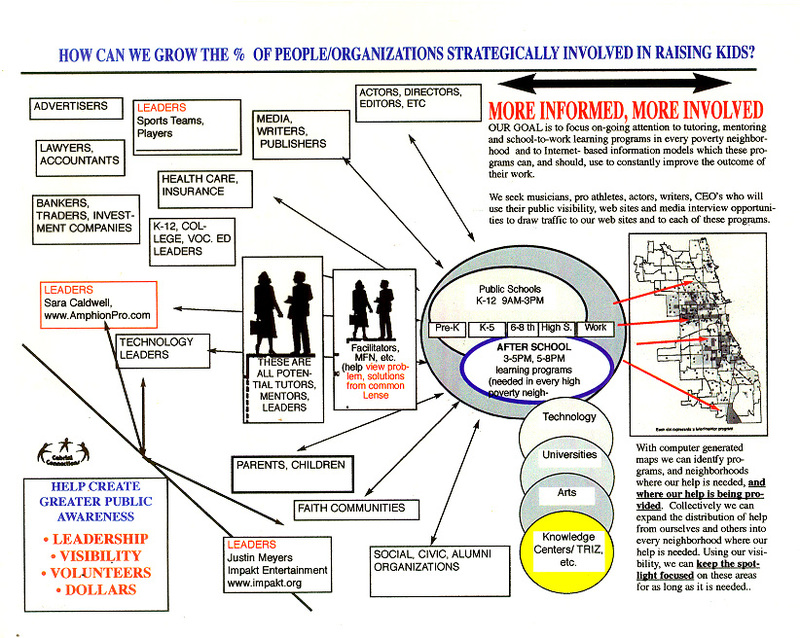 I created the other graphics shown below in the 1990s. They each communicate the same idea of using information to support decisions and problem solving. I launch a concept or idea with a blog post which I share via email and social media with my network. That's like the first stage of a fireworks explosion. When others pass my article on to their own networks, that's like the second and third stages of explosions that you see in a fireworks show. It's these efforts to pass on ideas that enables them to reach more people. I keep emphasizing that there's a cost for me to collect and host ideas in my web library and to launch these ideas on my blogs. While my goal is that people give time, talent and dollars to support tutor and mentor programs in all high poverty areas of Chicago and other cities, I seek some who will support my own efforts. We all want the same outcomes for youth. We need a knowledge base to support what we do to achieve these outcomes. Each of us has a network of friends, family, coworkers, etc. who we can reach out to in an on-going effort to draw people to the information in the knowledge base, and to places where we can connect with each other, and with organizations working directly in different places to bring tutoring, mentoring and learning opportunities to youth. Every time that you pass on articles like this you are part of an information sharing fireworks display! You are taking an active role in building the "village" of support kids and families need in high poverty neighborhoods throughout Chicago and the world. Every time you make a contribution to support my work you are supporting the work done at the bottom of the pyramid shown above. I led a volunteer based tutor/mentor program in Chicago from 1975 till 2011 and have collected a load of endorsements and paper archives. I've been digitizing these and last week converted a 22x26" Thank You, Dan! 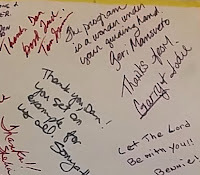 card from 1989-90, signed by students and volunteers. Click on the graphic at the left and you can see a few comments. I put the entire card into a PDF and uploaded it to Slideshare. You can view it below. Use your zoom button to enlarge and see all the signatures and comments. One of the joys of having led these programs is the enthusiasm and positive feed back that I've received. However, that has to lead to more than just "thank you cards". Read more after you view this. 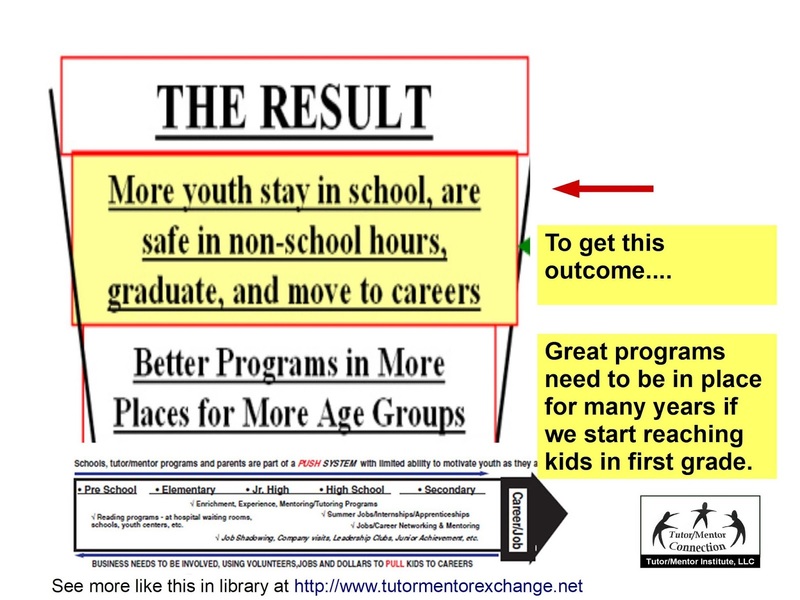 I created the Tutor/Mentor Connection in 1993 (and the Tutor/Mentor Institute, LLC in 2011) to help mentor-rich non-school programs grow in every high poverty neighborhood of Chicago and since then have created a huge library and hundreds of articles and strategy presentations that are tools others could used to help with this strategy. 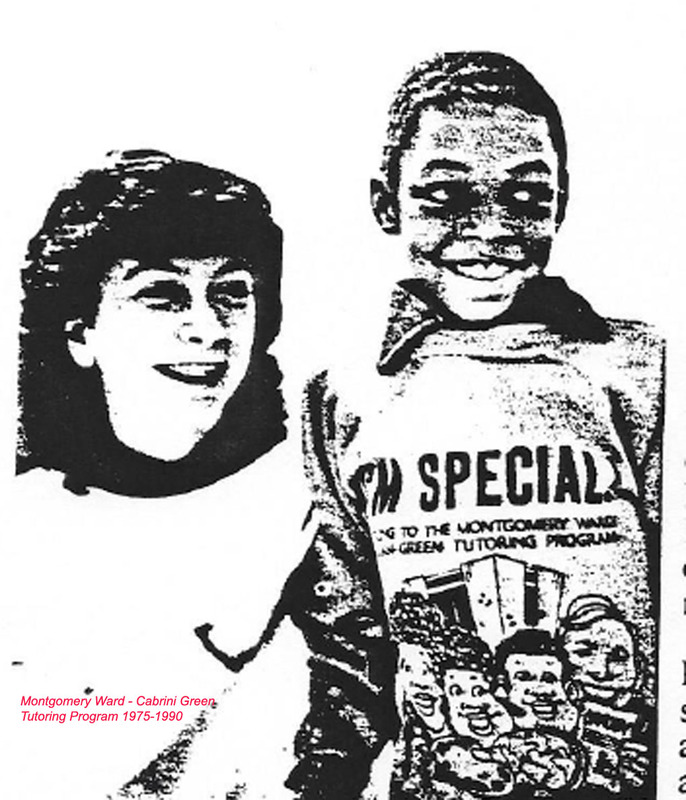 In the four-part strategy that we developed in 1993, step 1 focuses on collecting information, such as the database of Chicago tutor and mentor organizations. 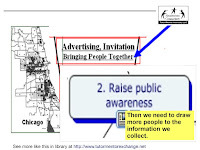 However, step 2 and step 3 focus on increasing the number of people who are using this information. Since I never had many dollars for advertising, and I'm not a celebrity or part of a wealthy family, or politically connected, this strategy has always depended on others carrying the ideas I launch on this blog and my web sites forward to their own friends, family and co-workers. This graphic illustrates how ideas I share can be shared by people who read them, with others who will read them and then pass them on to even greater numbers of people. I included this in a 2011 article, and in many others. 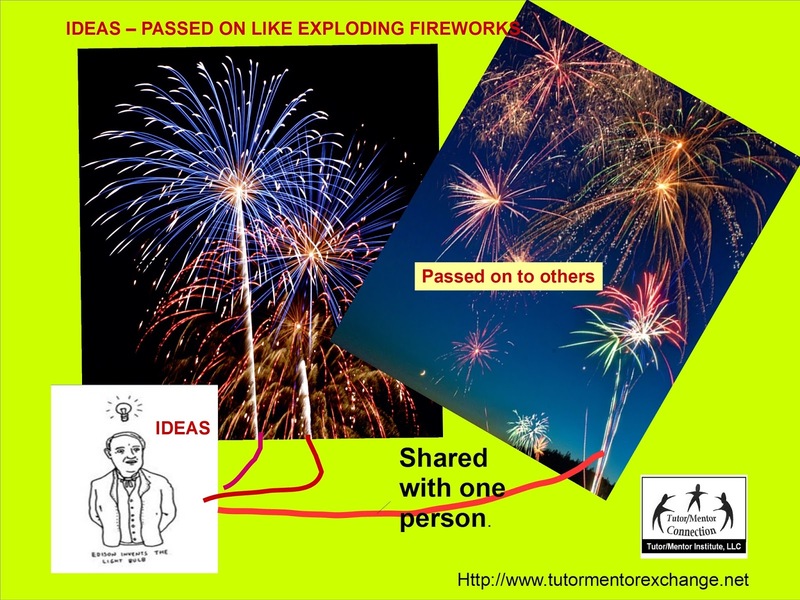 I was thinking about this last week during a Twitter chat with educators from around the world and the I began to think of this graphic as a form of fireworks. Posting an idea, like this article, is like lighting the fuse on a fireworks rocket. As it explodes it creates a constellation of stars, which represents people who are exposed to the message. Some of these also explode, creating another burst of stars, representing the message reaching a new network of people. Often there's a third, and a fourth blast, meaning the ideas are reaching more and more people. Think of my Tweets and articles as a daily blast of exploding ideas. 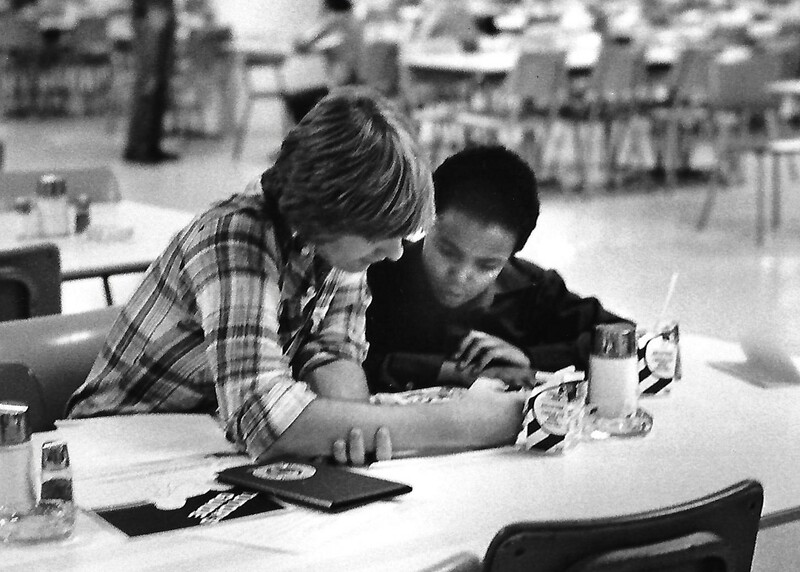 Since 1975 several thousand youth and adults have been part of tutor/mentor programs I've led. 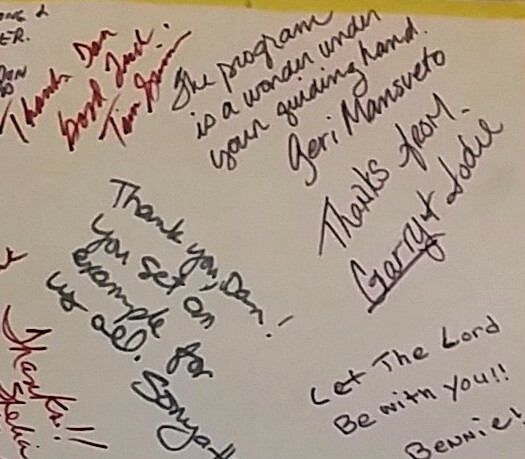 Some have provided endorsements and "thank you, Dan" messages, like those you can see above. However, so far, too few are passing on the ideas I share and taking actions that result in more and better volunteer-based tutor, mentor and learning programs reaching k-12 youth in every high poverty neighborhood of Chicago and other cities. In addition, too few are providing talent and dollars to help me continue this work, or to help me pass this entire library and mission on to a younger, more talented generation of leaders. I saw a tweet this morning with a quote saying "the best time to plant a tree was 20 years ago. The next best time is now" I re-tweeted it with this message. 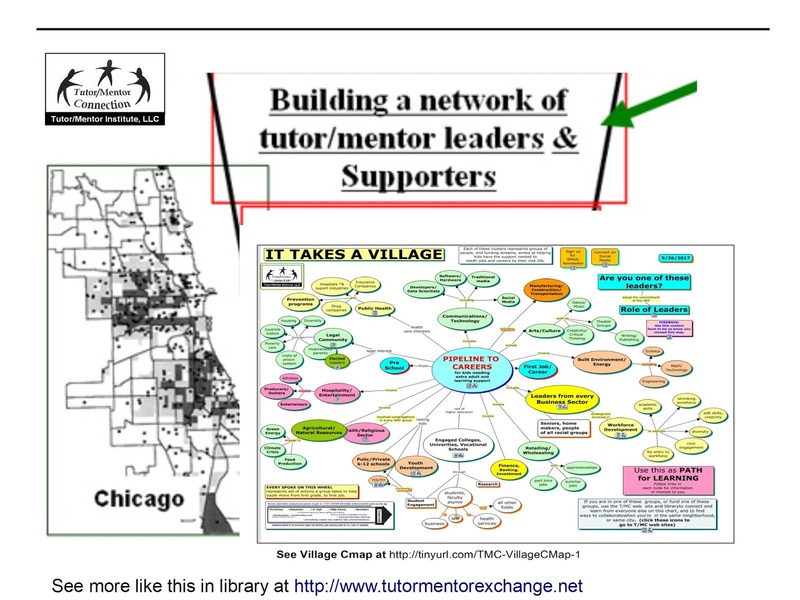 Had a few leaders helped me "plant the Tutor/Mentor Connection tree" in early 1990s, and helped me continue to nurture it for the past 24 years, I feel Chicago would have a much denser network of mentor-rich programs helping kids in poverty, and many more people taking active roles to share these ideas, get more people involved, and build sustainable and on-going flows of talent and dollars to every high poverty neighborhood of Chicago and other cities. Many might be able to show "thank you" cards from alumni students and volunteers on their own web sites similar to mine. If this interests you, read the "do-over" articles I posted last spring. And visit this page and use the PayPal button to send me some financial support. Over the 24 years I've led the Tutor/Mentor Connection (1993-present) and Tutor/Mentor Institute, LLC (2011-present) I've had many people say "I did not realize there was so much information here." or "Wow, that's a lot of information." That's not necessarily a complement. 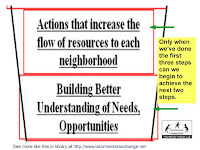 In a world where people want solutions in one page papers few are willing to do the deeper learning needed to develop broad strategies to complex problems that affect people in many places throughout the US and the world. I've persisted and I keep looking for ways to help people navigate the information I've been collecting. 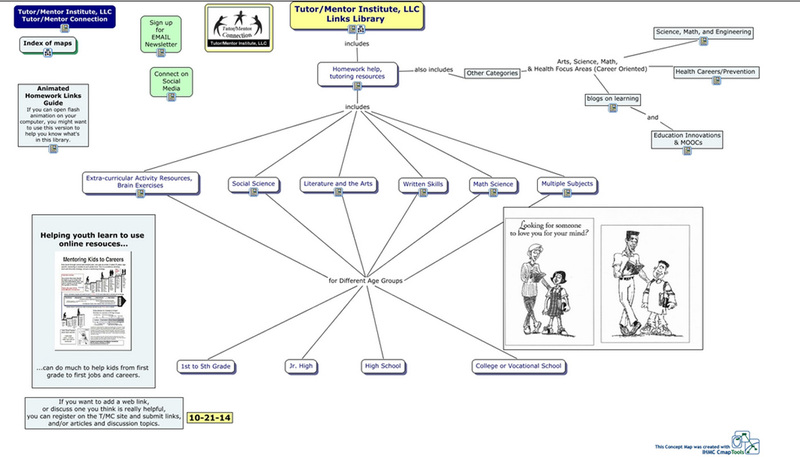 In the late 2000s I created a learning path concept map, intended for new staff working with me in Chicago. I've shared it as a guild others can also use. 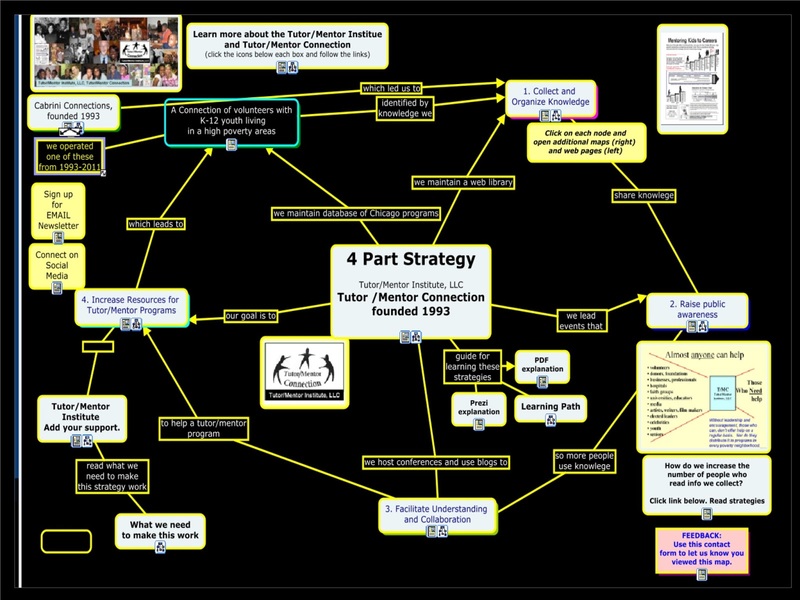 Today I highlighted some sections using Thinglink. Click on the dots and learn more about what's included in each section of the map. This information can be used as curriculum for high school or college level leadership training and can also be used to guild businesses and organizations as they look for solutions to poverty, inequality and other complex problems. Furthermore, students in middle school, high school and/or college could be looking at my strategy articles, the same way interns have done in the past, and then creating their own interpretations. Not only will they learn the ideas and strategies that they study, but they will also learn new ways to communicate ideas. These are valuable skills. I'd be happy to walk you through this information, in person if you're in Chicago, or via Skype if you are located elsewhere. In the aftermath of hurricane Harvey and in anticipation of hurricanes Irma and Jose many are creating information platforms that use maps to show where the storms are hitting and resources that people can use to survive and recover. These also point to organizations who are providing service and who need donations and volunteers to do their work. I point to some resources in this section of the Tutor/Mentor web library. 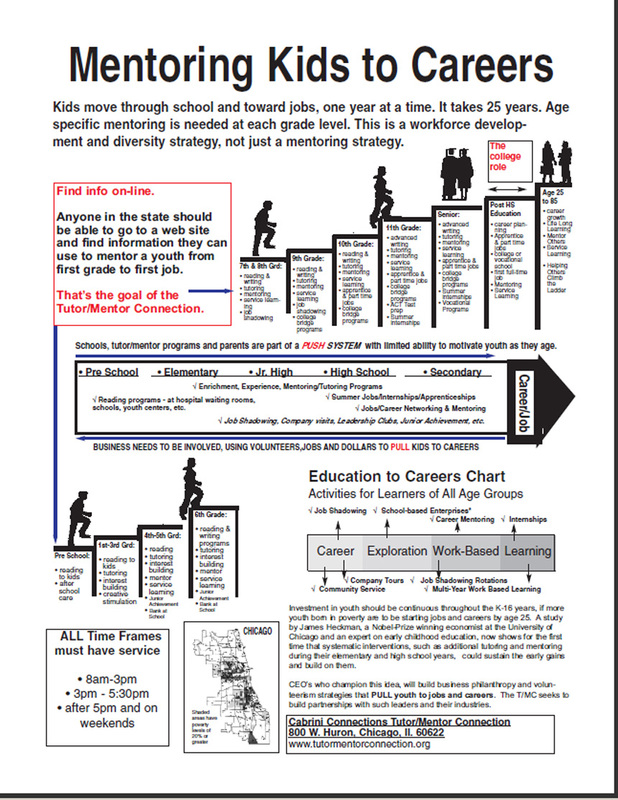 In the early 2000s I created a pdf that shows how volunteers who get involved in a tutor/mentor program often become evangelists who draw other volunteers and donors to support the program. In 2007 an intern created an animation to illustrate what I call a "service learning loop". Today I created a Thinglink to point out different parts of the loop. Click on the dots and read the information provided. All five parts of this loop are important. The weakest links are 1) support for knowledge aggregators who collect and share information others can use to get involved, and 2) not enough intermediaries who use their time, talent and communications ability to draw attention to the knowledge (right side) on a regular basis, so that more people use it to find where and how they can help (left side). Below is another version of this graphic. I've used this and similar graphics to emphasize the many years it takes for kids to grow up. There are no quick fixes. The same is true for disaster recovery. While many are needed in this intermediary role, investors need to also fund the work done by groups who collect and organize information. This needs to be done on a regular basis, and for many years. I wrote an article a while back showing some of the challenges involved. I hope those who read this article will see themselves in this intermediary role and will share the article with others using social media and personal communications channels. That's putting this lesson into action. Recovery efforts are now taking place in Texas, Louisiana and other places in the world where floods have caused recent human tragedy. At the same time, school is starting in Chicago and other places, including in flooded areas, and kids living in high poverty areas are facing an on-going human tragedy of too little support from home, community and school. There are some common challenges in both areas. 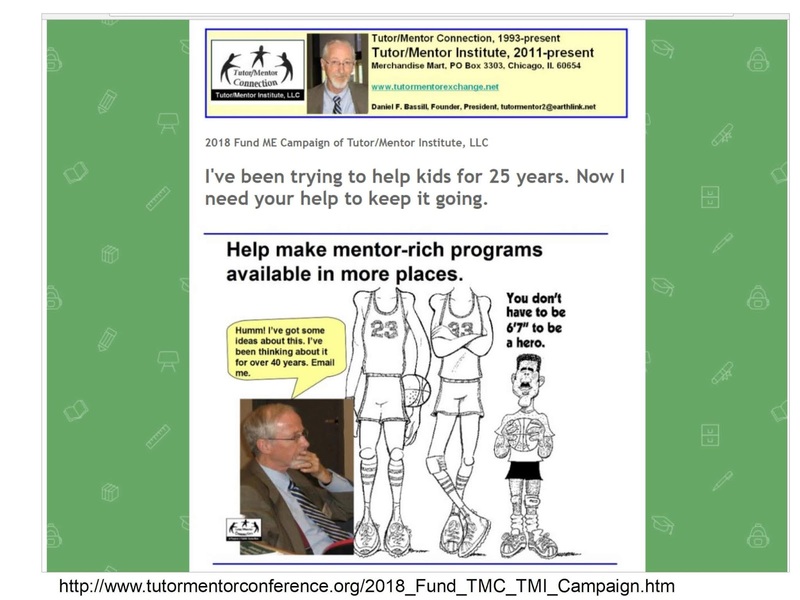 I launched the Tutor/Mentor Connection (T/MC) in 1993 in an effort to build a master data-base of non-school tutor and/or mentor programs operating in the Chicago region, in an effort to provide information that leaders in business, politics, education, philanthropy, etc. could use to determine if there were enough programs serving different age groups in all of the city's high poverty neighborhoods. 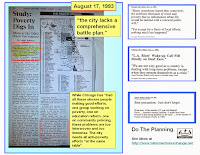 My goal was that the maps and database I was hosting would be used to support on-going public education and marketing plans intended to draw ideas and resources to programs, while helping programs network and learn from each other. The goal was to have great programs in every neighborhood, not a few great programs in only a few places. You can find my list of programs and most updated map here. from the age of 7-16 years of age in the Near North Area." Over the past 23 year's I've responded to these requests by pointing people to the directory and list of programs, so they could shop and choose from what was available. I've often had to say "none there", which means you and your community need to start programs if your kids are to be served. I've offered the information on my web sites as a resource for such efforts. I've never had much help doing this, and even less since 2011, however, the need still exists. Thus, I seek volunteers and partners who will help me keep the information up-to-date and help build awareness so more people use the resource. View this presentation then read more below. Without a map showing where help is needed and what organizations are providing services, with layers showing age group served and type of programs offered, it's impossible to know if a city has enough needed services in all the places where they are needed. a) adopt a section of the city and review youth program web sites; make sure they are working; tell me of broken links, or new programs that I need to add. Get to know what these programs do, and how they differ from each other. Share news about these programs via social media, blogs, church bulletins, company newsletters, etc. b) dig deeper into the theory of change and design of programs. Look at similar programs throughout the country/world and build a list of "what looks best" type programs that others can learn from. Update this regularly. Build an understanding of what type of program design is best for the needs of different age groups and client groups. c) help me update my own technology and communications capacity. Look for ways to share ownership and carry this into the future. This is all part of a four-part strategy described in this article. Now, how does this relate to disaster relief? Without maps showing the areas flooded by the recent Hurricane,with overlays showing service providers needed at different stages of recovery, high profile areas like Houston will draw most of the recovery resources while lesser visibility areas will receive too little. Even within Houston it's likely that more affluent neighborhoods will attract greater support than the high poverty areas. 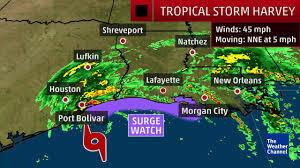 For instance, https://weather.com and this ESRI site provides numerous maps showing flood areas. 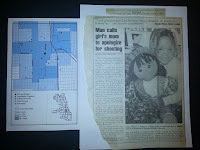 The maps are professionally done and provide great information about where the damage was greatest. However, they don't include overlays of recovery support organizations who need volunteer and donor help to do their work. Here's a site that is showing resources people are looking for, with a map showing shelters. SketchCity, a tech group in Texas, has been creating some information-based maps, like the one showing shelters. This is all useful, but is it enough? What help do kids in poverty need? What help do disaster recovery areas need? 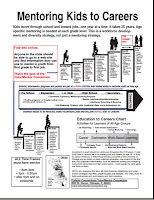 I've been using cMaps to create a visual blueprint that shows different supports kids need as they move through school and into jobs and careers. These supports are needed in every high poverty neighborhood for many years. 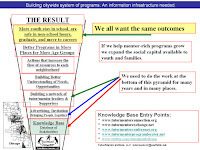 Thus far, I know of no one collecting and mapping such information, like I describe in the presentation shown above, to show availability, and provide support, for all of these needed services. Here's a HBR article talking about the impact of Harvey on poor people and advocating for prevention efforts, before the disaster occurs. Here's another from the Washington Post. 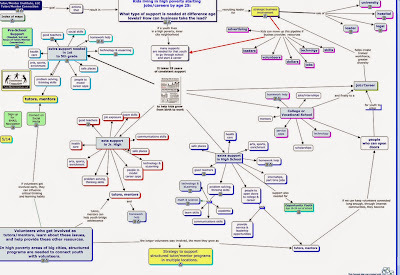 Many issues mentioned in these articles represent nodes on a concept map like mine. Concept maps and other visual tools could be used to show the various short and long-term disaster recovery support needed, not just in Houston, but throughout the world. 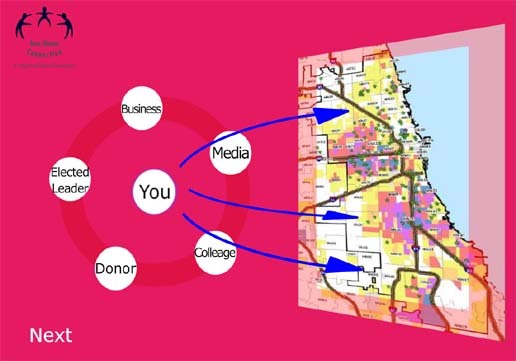 Visualizations like mine might already be available some place within the US and worldwide disaster-relief ecosystem. If they are I don't see people on social media pointing to these and calling on volunteers and donors to use them to guide their efforts. I don't know. Maybe readers who do know will share links. What I do know is that many volunteers, donors and leaders are needed to collect, organize and maintain such information, and keep it updated for many years. And many more are needed to build the daily and on-going marketing and communications needed to draw volunteers and donors to the information, and then to all of the areas where kids, or disaster victims, need help, now, and will need help many years more into the future. The preseason is over and the games that count are set to begin. College football's kickoff weekend is here. Millions of eyeballs are getting set to spend three to 10 hours or more a week watching the games. Every team's players have mastered thick and thin playbooks. Coaches have been doing chalk-board talk and using "x" and "o" diagrams to outline winning plays. 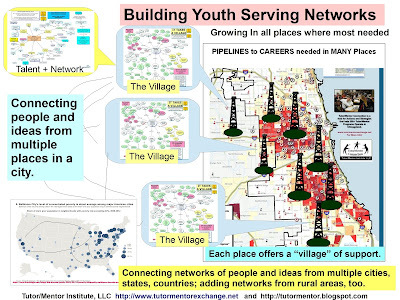 How can we get just a fraction of that attention and game design effort focused building and sustaining great youth development teams in high poverty neighborhoods throughout the country? 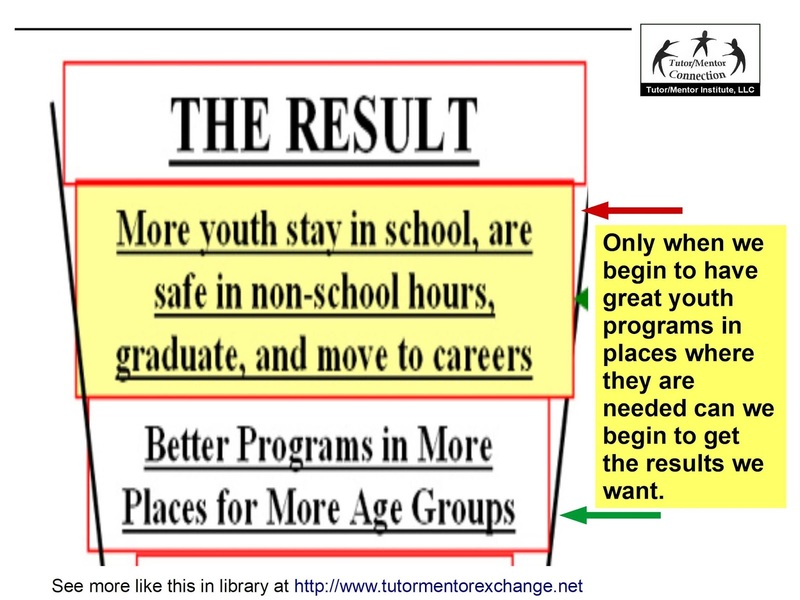 Here's a diagram from the Tutor/Mentor Institute, LLC playbook. It shows the goal of helping youth through school and into jobs and careers and the need for programs reaching every age level, in the school day and non-school hours. It's one of many visualizations you'll find if you browse articles on this blog or pdf essays in the Tutor/Mentor library. I've written many articles in the past showing roles that athletes and coaches might take beyond what they already do to help kids and communities. 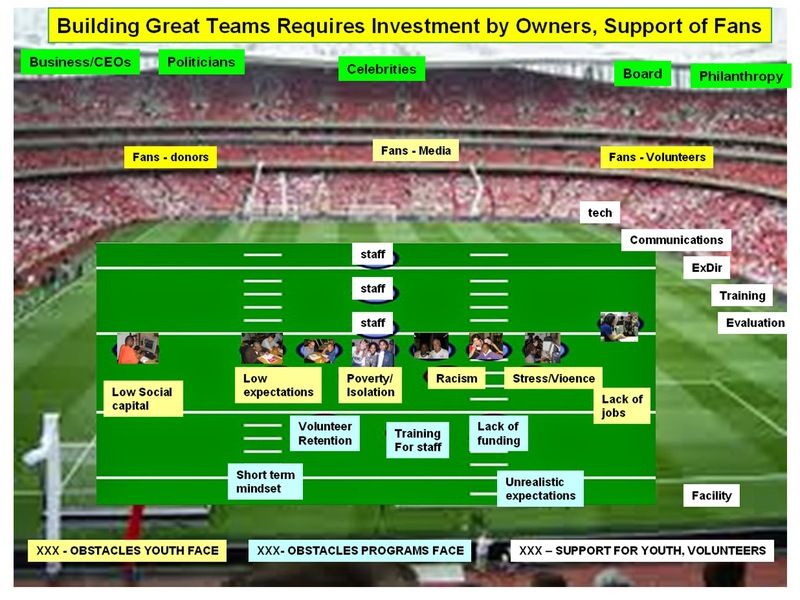 My articles focus on building great teams, which is work owners, media, coaches and fans all help with. I go beyond the great play or a single game, to building leagues and great teams in many places. 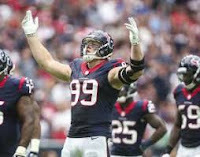 In the past couple of weeks J.J. Watt of the Houston Texans has raised over $10 million for flood relief in Texas. This is a great example of the power of celebrities to mobilize resources following a disaster of huge magnitude. I've seen similar efforts focused on helping a single child suffering from a disease or personal difficulty. What I've not seen are maps, charts, and a game plan...for raising kids, or preventing environmental disasters. Do a search for J.J. Watt on Google, then look at the images. Do a similar search for other celebrities and sports stars. Then do a search for Tutor/Mentor Connection and look at the images. Look at the maps and visualizations on the T/MC search. Click into blog articles and see how they are used. Think of these as the "x's" and "o's" for making life better for disadvantaged or suffering people. Think of this as the game of life, with celebrities serving as coaches, team builders, sports writers, etc. Think of how many more people would be thinking and acting differently if you found images like on the T/MC search when you looked up football, baseball and/or basketball players and teams, or TV, Movie and/or Music celebrities. Think of what it would mean to kids growing up in poverty neighborhoods, or people trying to rebuild after disasters like Katrina, Harvey, or the floods, famine and wars in Asia, Africa and the Middle East if you saw these images repeated over and over for many years. As you're watching college and pro football this week and in coming weeks, spend some time looking at the ideas I've been sharing and then think of ways to enlist sports teams and fans in this strategy. Take time to share this message on social media and via your own blogs or videos. Life is a team sport. Don't just watch. Participate.